Kris Meeke is still to discover whether he will retain his Citroen drive for the 2016 World Rally Championship. 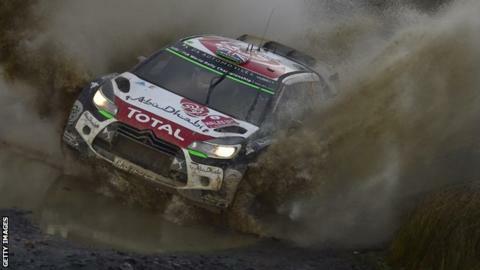 The Northern Irish driver finished second at Wales Rally GB, 26 seconds behind world champion Sebastien Ogier. Meeke, 36, and co-driver Paul Neagle secured three podium finishes in 2015, including a first World Rally win in Argentina in April. "My future's not secure yet but I hope this goes some way to try to secure that," he said. "I hope things will come clearer in the next week or so." Meeke's second place finish was the first top-three finish by a United Kingdom driver at the event since England's Richard Burns was third in 2001, and came 20 years after Scotsman Colin McRae won the Rally of Britain. "I really enjoyed it here right from the beginning," Meeke said. "My rhythm was good right from the start of the rally. "Seb never got too far away but I don't think we ever had a serious threat to win the rally against Seb unless he made a mistake." Dungannon's Meeke finished fifth in the drivers' championship and helped Citroen secure runners-up to Volkswagen in the manufacturers' title standings. "Coming into the last rally of the season, the situation with Citroen and the manufacturers' championship was really important," Meeke added. "We had that job to consider - and to secure Citroen second place made it a good weekend."